I have been fascinated by Time Machine ever since I heard & read about it. In past many have made fruitless attempts at making Time Machine a reality. Now most people know for sure that it is possible to travel in time but realize that it is not feasible to build such a time machine. Also nobody is yet able to build even a conceptual model of time machine. Still there are crazy people, mad scientists?, sane scientists hoping to build the Time Machine. Even I used to dream of making the first Time Machine, and yes I have indeed found it! For explaining the validity of the time Machine I found, I will use Lexigrams made famous by Linda Goodman’s book ‘Star Signs’. All English words and names, titles and phrases have their meaning & messages hidden behind them which can be revealed with the help of Lexigrams. 1. In original word or phrase or title vowels should not be more than 4 and letters excluding duplicates not more than 13. 2. every character should be used only once in a single word. 3. You can make as many words as possible and combine them to reveal meaning. 1. It/I/Man can tame time. 4. I am in time. Theory of Relativity gave birth to the idea of time machine. Let’s see what relativity says about time travel. It seems ‘Time Travel’ is a wrong term. It has nothing to do with travel. We are thinking in wrong direction. Traveling faster will take us in future, but how do we go back in time? We need to open our mind and leave behind the term ‘Travel’. It is misleading. Now is the time to present you the time machine. It has been known and used for ages. How is meditation time machine? Let us compare its lexigram with time machine’s. So all the features of time machine are present in meditation. But meditation is far more than a time machine. You still don’t believe meditation is time machine. These are the some of the abilities of mind developed through meditation. 2. Ability to see/know infinite future (clairvoance). warning: These and more abilities are outcomes of meditation and not goal in itself. Making these as goals will lead your mind astray and nullify any benefit of meditation. You may even experience a more disturbed mind than normal. Not everyone who meditate gain all powers. Some abilities of mind may even be false claims. You still doubt meditation as a time machine! You think I am superstitious? There is a device called HDR – Hyper Dimensional Resonator. 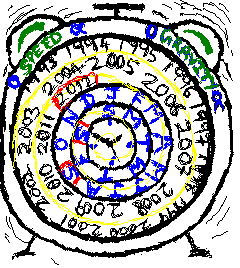 HDR and many similar Time Traveling devices have been made by Steven Gibbs known as the RainMan of time Travel. It is supposed to give you instant OOBE to be able to time travel. Let’s see what it has to reveal and whether it qualifies as Time Machine. So it qualifies as a Time machine, if it is really what it claims it is. What more does lexigram reveal about HDR? Still another Time Travel device created by Steven Gibbs is Multiverse Resonator-MVR. Let us analyze it. Time Travel is real. It is not a lie. Amazingly, it also confirms to the Time Travel rule. Also I must reconsider what I said above about ‘ Time Travel’. Now you may decide to do it with a device HDR or MVR, with no control on mind or Meditate and control mind accurately to do what you want. Creating a real Time Machine, that can take man ahead or behind time physically at will, may be a great feat for science and man, but it adds nothing to make man a better human. Its our mind that should be developed. Mind can matter.